Social capital might be a new term, but what it describes has been a staple of human experience for millennia. In short, social capital refers to the close ties between people who live and work together. As we age, and especially as we retire, we lose much of that social capital we’ve spent a lifetime cultivating. This may not sound too bad, but multiple studies suggest a strong correlation between social interaction and health among older adults. These studies, as the National Institute on Aging explains, have found social relationships to be consistently associated with good mental and physical health. “Isolation blues” is really just a form of depression incurred from being isolated from friends, family or the world in general. The best way to combat this type of depression is through socialization. 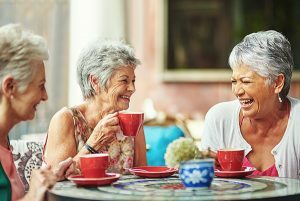 This can be difficult if you’re already in the habit of staying home most of the time with little social interaction, but one of the many benefits of moving to a senior living community is that it provides numerous opportunities to socialize and make new friends. This need and desire for socialization is a key factor in all we do at The Avenues Crofton Park, with a robust social calendar and spaces for ongoing socialization and interaction between residents. To avoid isolation, it is also important to stay connected with friends and family. Technology has made this simple: cell phones, e-mail and social media are just a few ways that technology can help you and your loved ones stay connected at a moment’s notice no matter how far you might live from each other. Social activity also is key for staying healthy and staving off cognitive decline. The University of California, Berkley, notes that people with frequent social contact are affected 70 percent less than those with low social activity when it comes to the rate of cognitive decline. Conversations, activities, and everything that comes with being social helps ward off cognitive decline by forcing you to use your mind in new and novel ways. The more new and interesting people and activities you interact with, the better your overall health. By design, The Avenues Crofton Park offers a busy monthly calendar of activities, classes and social events so you won’t have to look very hard – or go very far – to stay happy and healthy in an engaging community such as ours!